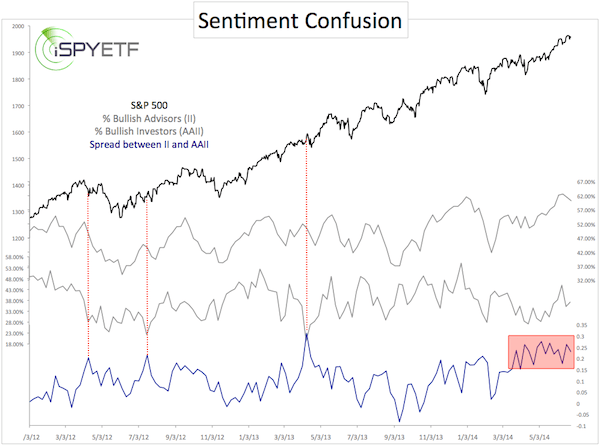 More than ever before, investors are looking at various sentiment gauges to get a pulse on the market. After all, excessive optimism correctly foreshadowed every recent crash or correction. But, there’s a big sentiment divergence right now. The 2000 and 2007 market crashes, and even the 2010 and 2011 corrections were preceded by excessive investor optimism. Well, once bitten, twice shy. Investors are trying their darndest not to make the same mistake again. Nobody wants to get left holding the bag … again. That’s why investor sentiment indicators are more closely monitored and written up today than at any other time (at least it feels that way). How optimistic or pessimistic are investors right now? Frankly, it depends on who you ask. If you ask investment advisors and newsletter writers (as Investors Intelligence – II – does every week), you’ll get bullish forecasts from 60.2%. If you ask retail investors (as the American Association for Individual Investors – AAII – does every week), you find that only 37.20% of ‘average Joe’ investors are bullish. This is unusual. How unusual? The chart below plots the S&P 500 against the percentage of bullish advisors (II), the percentage of bullish investors (AAII) and the difference between the two (II – AAII). We saw a similar discrepancy between retail investors and advisors in April 2014, but the current spell of differing opinions is the longest stretch since at least the 2007 market top. Prior instances since 2012 led to smaller pullbacks followed by continued gains. However, the sample size is too small to draw any high probability conclusions. Overall investor sentiment (a composite of six different sentiment indicators) is at or near a bullish extreme (today’s Sentiment Picture – published by the Profit Radar Report – contains a detailed look at six different sentiment gauges). The S&P 500 is struggling to move above major resistance around 1,955. In fact, this resistance is so significant that the 2014 S&P 500 Forecast (published by the Profit Radar Report) projected a May/June high at 1,955 on January 15, 2014. We have yet to see sustained trade above 1,955. Obviously, the market considers this resistance cluster important. What are the odds of the S&P 500 reversing here? Could this be a major market top? After many weeks of relentless gains, the S&P 500 is showing first ‘chink in the armor.’ In fact, there are three persuasive reasons to expect lower prices, but there’s also one strong force that’s pushed the market continuously higher. 1) Bearish reversal candle: On Tuesday the S&P 500 shot higher, but closed the day below its open price. This created a red reversal candle. A similar reversal candle on April 4 led to further weakness (blue boxes). 2) S&P 500 reversed at resistance. 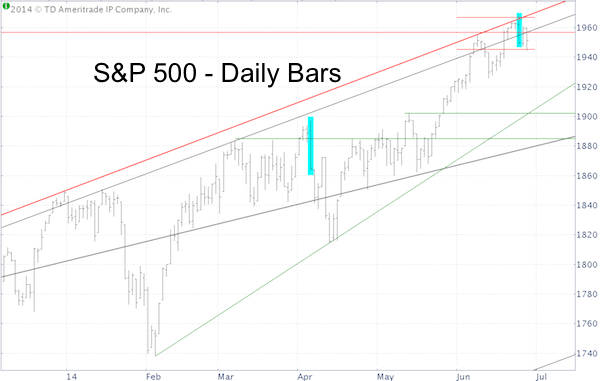 The S&P 500 reversed at the ascending red trend line (which connects all highs since April 2, 2012) and monthly pivot resistance (short red line) at 1,967 (both outlined in the June 22, Profit Radar Report). 3) S&P 500 moved above and dropped back below long-term resistance: In its 2014 S&P 500 Forecast (published on January 15), the Profit Radar Report projected a pre-summer market top at 1,955. Why 1,955? 1,955 is a convergence of two significant resistance levels: a) Long-term Fibonacci projection resistance (red horizontal line) and b) Parallel trend channel going back to the October 2011 low (black line). The S&P 500 (NYSEArca: SPY) has run over similar setups before. Although this time may be different, we should keep in mind that one snow goose doesn’t make for a winter. Especially since there is one force that continues to drive stocks higher. This force is not QE. No, it’s much more visible. In fact, it’s an ‘in your face kind of nuisance’ that’s easily assessed, but often overlooked. False Promises: Where is the Promised Crash or Correction? On April 2, USA Today essentially started a virtual countdown to the 1987-type market crash. May 24 was supposed to be ‘crash day.’ The market crash is obviously delayed, but is it also cancelled? The article spread like wild fire and tripped off an avalanche of ueber bearish media coverage. “The market could be in some serious trouble in 37 trading days. In 37 trading days, the ongoing bull market would be 1,311 trading days old, says Jim Paulsen of Wells Capital Management. That is a scary date because it was on the 1,311 trading day after the start of the 1982 bull market that the Standard & Poor’s 500 suffered its biggest one-day crash in history. The S&P 500 chart below (featured in the same article) supposedly confirmed the strong correlation and implication of a crash. 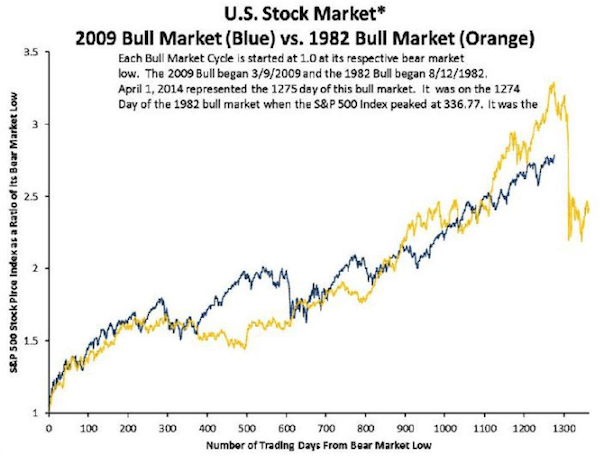 May 24, 2014 was ‘D-day,’ according to this rudimentary method (counting days to determine a market top doesn’t deserve to be labeled as analysis). The wave of media pessimism reminded me of an analogy a friend from New Orleans introduced to me: ‘Crabs in a bucket’. He explained that ‘down here’ when you buy a bucket of live crabs for your backyard boil you never need a lid. As soon as one crab crawls to the top the others pull him back down. The bearish media coverage ‘scared every bullish crab back to the bearish bottom,’ leaving plenty of buyers to drive up stocks. Including media headlines in a market analysis model may seem like nonsense to some, but it’s a contrarian indicator that’s right more often than wrong. At the beginning of the year I formulated a 2014 S&P 500 forecast based on seasonality and cycles, technical analysis, Elliott Wave Theory, support/resistance levels, divergences (or lack of divergences) and various sentiment measures. 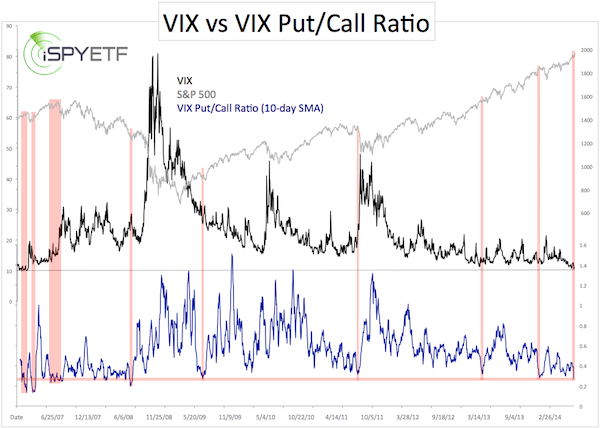 VIX Put/Call Ratio Drops to 6-Year Low – Does This Foreshadow Single-Digit VIX? Option traders are flocking towards call options, as the put/call ratio has dropped to 0.1. This means that there are 10 call options traded for every put option. A contrarian interpretation of this data points to even lower VIX readings, but this is not a contrarian indicator. The VIX put/call ratio dropped to 0.1 yesterday, which means that there are 10x more call options traded than put options. The 10-day SMA of the VIX put/call ratio fell to 0.273, the lowest reading since July 21, 2008. A contrarians initial impulse (most sentiment indicators carry a contrarian message) would be to expect even lower VIX readings. However, a look at similar historic setups suggests that the ‘herd’ (call buyers) may actually end up being right. The chart below plots the VIX against the VIX put/call ratio. The S&P 500 is also included for additional insight. The red lines highlight similar extremes. A similar put/call ratio extreme in January led to a 50% VIX spike. Most other occurrences were followed by a VIX rally within the next couple of weeks. The only outlier is the March 2007 extreme, which was followed by a declining VIX and rising S&P 500 (NYSEArca: SPY). VIX seasonality has not yet bottomed, but it’s getting close, enhancing the meaning of the low put/call ratio. VIX Hits Another 88-Month Low – Is it Finally Time to Buy? Gold just saw its biggest one-day gain of the year. At the same time the S&P 500 climbed to yet another 1-year high. Since 2009, this constellation happened three times, and led to short-term S&P 500 weakness every time. Gold jumped 3.26% on Thursday, the biggest one-day gain of 2014. 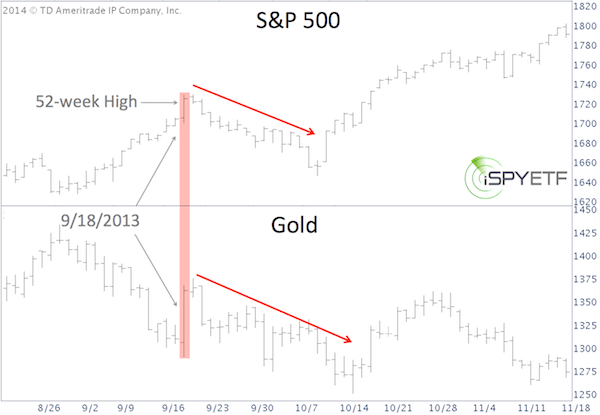 Ironically, such a display of gold’s strength is short-term bearish for the S&P 500. 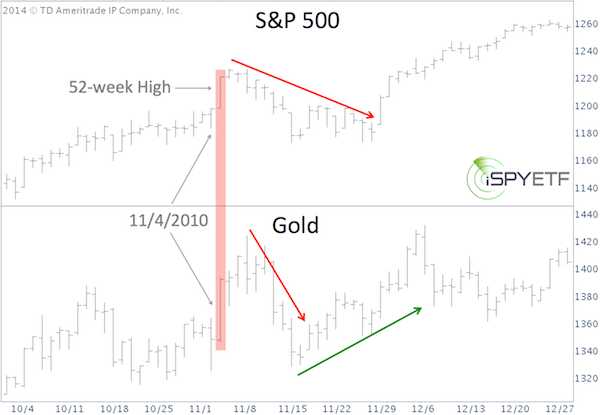 Since the beginning of the post-2009 QE bull market, there’ve been three prior occasions when gold staged the biggest move of the past six months, while the S&P 500 (SNP: ^GSPC) traded at new 1-year highs. S&P 500 pulled back immediately. Gold staged a minor pullback a few days later before moving higher. S&P 500 grinded higher for a few more days before a multi-week correction. S&P 500 and gold pulled back immediately. Thus far in June, gold bounced from 1,238 to 1,322. Based on gold seasonality a bottom for gold may be in. But gold cycles and the lack of a real washout selloff suggest another new low. Silver cycles are a bit more bullish than gold, that’s why the June 15 Profit Radar Report recommended to buy silver at 19.6 (silver spiked as high as 20.1 today). Gold is getting closer to its initial up side target around 1,330 and the S&P 500 is at the up side target (1,954) projected by the Profit Radar Report back in January. 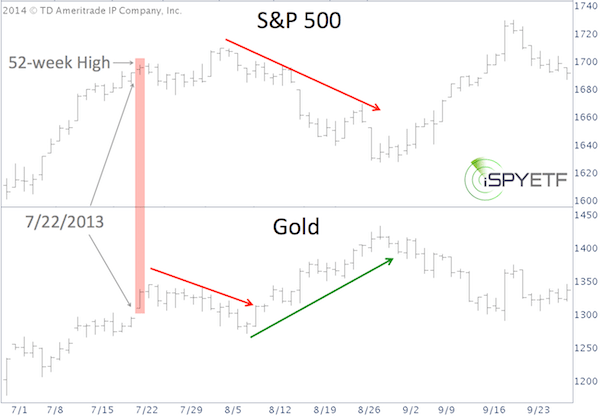 It’s too early to panic sell, but risk for gold and gold ETFs like the SPDR Gold Shares (NYSEArca: GLD) and the S&P 500 (NYSEArca: SPY) is rising. Why is S&P 1,954 so important? Here’s why the Profit Radar Report pegged 1,954 back on January 15, 2014. Traders have been itching to buy the VIX. However, the VIX has frustrated anyone impatient enough to buy bullish VIX bets … so far at least. Here is why the VIX wasn’t ready to rally yet, and why this is about to change. Patience is a beautiful flower, but it doesn’t grow in every garden. Patience is also an attractive character trait, but it doesn’t come easy. In fact, patience is perhaps the most underrated requirement for a successful trader or investor. Few things get contrarian investors as excited as 52-week lows. But forget about 52-week lows, the VIX has been flirting with 7-year lows since May. The iPath S&P 500 VIX Short-term VIX ETN (NYSEArca: VXX) has seen many successive all-time lows. How often do you get an opportunity to buy at an all-time low? Not surprisingly, investors have been itching to buy the VIX, but like a stubborn mule the VIX continues to inch lower trampling on premature longs. I commented on this bold bet in a May 23 article, stating that: “The odds of this bullish VIX trade paying off are not good.” Why? 2) Contango. Bullish VIX investment vehicles suffer from contango, which is caused by continuously rolling over the next VIX futures (tomorrows VIX futures are almost always more expensive than today’s). This condition persistently eats away at bullish VIX related investments. 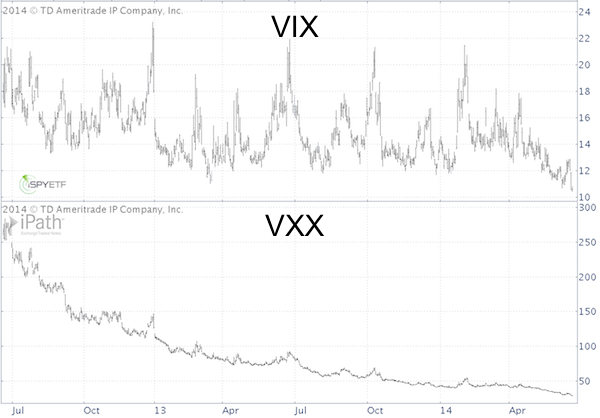 The chart below plots the VIX against the VXX ETN and highlights the magnified price erosion of VXX. The VelocityShares Daily 2x VIX Short-term ETN (NYSEArca: TVIX) suffers from the same condition. The VelocityShares Daily Inverse VIX ETN (NYSEArca: XIV) on the other hand benefits from contango. 3) This is the most important reason for a lower VIX until now: VIX seasonality suggested continued weakness. The May 21 Profit Radar Report pointed out that: “VIX seasonality is not yet supportive of higher VIX readings,” and featured an invaluable VIX seasonality chart. This page will also include a link explaining why the 1,955 level is crucial for the S&P 500 (NYSEArca: SPY). How the S&P 500 reacts is important to VIX movements. Last week the CBOE Equity Put/Call ratio slipped as low as 0.43, the lowest level since January 2011. Similar readings in April 2010 and April 2012 led to nasty sell offs? But something is different this time. Last week the CBOE Equity Put/Call ratio plunged to 0.43, the lowest reading since January 2011. This wasn’t just a one-day fluke as the 5-day SMA fell as low as 0.518, also a 41-month extreme. A ratio of 0.43 means that option traders bought 2.3 calls (bullish option bet) for every put (bearish option bet). Option traders don’t have a ‘smart money’ reputation. The chart below, featured in the June 11 Profit Radar Report, plots the S&P 500 (SNP: ^GSPC) against the 5-and 10-day SMA of CBOE Equity Put/Call ratio. As the dashed red lines highlight, low put/call ratio levels led to S&P 500 (NYSEArca: SPY) weakness more often than not. Is the Put/Call Ratio Warning of a Crash? Lately, there’s been much talk about a crash or major correction. Does the current equity put/call ratio foreshadow such a crash or correction? Looking at the put/call ratio in isolation one could conclude that there’s a high chance of a 1%+ correction. Why? Similar equity put/call ratio readings in April 2010 and April 2012 were followed by nasty sell offs (see red shadows). But let’s expand our analysis to include the CBOE SKEW Index. The SKEW Index basically estimates the probability of a large decline (2 standard deviations or ‘Black Swan’ event). Readings of 135+ suggest a 12% chance of a large decline. Readings of 115 or less suggest a 6% chance of a large decline. In short, the higher the SKEW, the greater the risk for stocks. Last week the SKEW finished at 127.78, which is above average, but well below its January peak of 139.62. The April 2010 and April 2012 highs saw SKEW readings of 134 and 139 (shaded areas). The relative SKEW anemia softens the generally bearish message of the put/call ratio, but it doesn’t eliminate all the risk. The Profit Radar Report’s 2014 S&P 500 Forecast (published on January 15), projected a pre-summer high at S&P 1,950. Last week the S&P reached 1,950 and pulled back. What does this mean for the rest of the year?